© 2018 – Bushidokan™ Yudanshakai, Inc. All Rights Reserved. Like most martial artists, I also once suffered from the versatility syndrome. Whereas, every attack must have a separate and distinct counter attack. One of the reasons we do this is to show off our diverse repertoire of techniques. Plus, if you make your living teaching a martial art, you normally give a lot of demonstrations. Consequently, you need to show your various “waza” (techniques and tactics). An audience needs to be entertained, as well as educated, and if the instructor kept doing the S.O.S. (Same Old Stuff), potential customers probably would not respond as receptively as they would to many different techniques and tactics. Therefore, the need to be versatile instigates the desire to attempt more flamboyant and spectacular feats. However, when your life (or even your health) is on the line, Simple and Similar will prove out over flashy, flamboyant, and versatile…time after time! One: PRACTICE…Say you have five Weapon Threat Defensive Tactics that utilize a very similar tactical series. Therefore, every time you practice any one of those five defense tactics, you are essentially practicing the other four. Consequently, you are building five times the response, reflex, and pattern programs than you would if you used five dissimilar tactical responses in the five separate similar situations. Two: STRESS…In a stressful situation, particularly a dangerous or life threatening situation, your brain does not operate quickly (or even very well). For the most part, your brain will only respond to conditioned reflexes. The more conditioned the reflex and pattern mode is, the faster and more effectively your brain will respond to using it. You will simply have a five hundred percent better chance of responding and executing a “Five for Five” pattern programmed into your conscious / subconscious than you would with a “One out of Five” possible pattern. Therefore, plain common sense should dictate to you to play the odds. The less you have to recall under stress, the better your chances are of surviving and even prevailing over an assailant. Three: REPETITION…Repetitive practice of similar tactics not only hones your tactical recognition, reflex, and response factors, but each technique used in that tactical series becomes fine-tuned for speed, power, and accuracy. Practical Practice Equals Practical Application – That equates to a longer, healthier, and happier life. Use the SAME OLD STUFF In The SAME OLD SITUATIONS! Don’t allow yourself to get surprised. Use the Element of SURPRISE yourself! Remember, the Element of Surprise has won (and will win) more fights, battles, and wars, from the first monkey with a stick, to the last nuclear war, than all other factors combined. Keep it SIMPLE, Simon…Leave the flash to the movie stars. They get to choreograph and practice each sequence as many times as necessary…You’ll only get one shot (no pun) in the mean street. Keep It SIMILAR…Save the versatility for the demos, just don’t con yourself into using or teaching too many diverse tactics for real-life situations. Let me give a further example…Most martial artists (especially karate-ka) often have hundreds of various techniques that they can perform, while boxers only have five major techniques. Yet boxers do five to ten times better in street fights than do most martial artists (especially karate-ka). Plus, the average boxer will knock the crap out of ninety-five percent of the black belts in the world, regardless of the discipline or art. Then again, I’d hate like hell to attempt to “Out-Box” a dude with a knife, a club, or a broken bottle. Actually, as a martial artist, we have many superior techniques (too many for a lot of us). So, let’s fine tune our best techniques and use them sparingly, practically, and efficiently! Simple self-defense means simple techniques and simple tactics. Why use a jump-spin kick when a simple front kick would be more practical? Most martial artists prefer “show” to “go”. They like to look good, flashy, flamboyant, spectacular, etc. They love to perform…they love to impress. 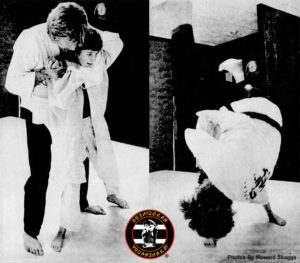 I remember looking at the old Kick Magazine series that was called “Self-Defense Techniques of the Masters” (or something like that)…where four or five so-called “Masters” would demonstrate their defense methods against a left jab, right cross, front kick, knife stab, full nelson, rear choke, etc. Now, I never saw more than a dozen or so episodes of that particular comic strip, but with the exceptions of Joe Lewis’ and Benny Urquidez’s simple, practical, and obviously effective versions, I found virtually all the others amusing to ridiculous (mostly ridiculous). It appeared that each “Master” attempted to out-do the others by demonstrating a more complicated or “artistic” (absurd) sequence, while Ole Joe and Ole Ben just demo’ed some simple stuff that was pregnant with common sense and practical application. It was obvious that most of the other “Masters” hadn’t been in a real fight since kindergarten…So much for my unsolicited candor. Meanwhile, back in the alley…The three biggest mistakes most martial artists (especially instructors) make when concocting their defense repertoires is that: One; they assume that they will always know in advance exactly what the adversary will do. I guess I must be kind of dumb and sort of slow because I always had a helluva time figuring out if the other dude was going to throw a left or a right first. I was even worse at guessing if a punch, kick, jab, cross, hook, slash, thrust, stab or whatever else was coming first (or next)? Two; apparently most martial artists are under the false impression that an assailant will make the first move and then instantly “freeze” – holding that pose until the martial artist finishes him off with several dashing and devastating moves. I must have been born under a bad sign…I was never lucky enough to get one of those dudes who turned to stone after they missed (very fortunate) their first move. Three; they all seem to believe that mean, pissed-off, drunk, hopped-up, and half-crazy bullies, thugs, rapists, and all other assailants are so easy to hurt. They must have been dealing with a higher class clientele with lower pain tolerances than I ever did in most of my encounters. I’ve run into some dudes that have taken one of my best shots with a grin and then just licked their chops for more…Well, enough sarcasm…Even if it is true! Number One: With proper training and practice, especially utilizing contact sparring, both bare-handed (meaning no weapon, not, no gloves) and against weapons, you can soon learn to read an opponent’s actions and body language, and then begin to anticipate his probable attack. The less skilled he is, the more he will telegraph his intentions…and the more experienced you become, the better you will get at reading a more skillful opponent. But, don’t attempt to guess too specifically. To guess wrong, especially against a weapon, is worse than not guessing at all. For example, should I read in an assailant’s body language that he is going to attack with a hand strike or punch, I do not attempt to guess if it’s going to be a jab, cross, hook, or even if it’s going to be a right or left. I will simply try to drill him with a back fist and / or a front kick, depending on if his hands are up (ready mode) or down (belligerent mode), the second he steps into contact range (or the “Dumb Distance”). Number Two: I never rely on dropping him with just one shot…nor do I (especially) rely on an opponent holding his pose for me. I do expect the back fist or front kick to at least distract his attention and possibly get his hands up to his face or down to his bells momentarily. However, whether I get much of a reaction from the back fist and front kick or not, I step down and deliver a cross, hook, and uppercut as quickly and accurately as possible. If my front kick doesn’t make him pray, I had better have some heavy artillery outgoing, post-haste. That’s just one example of how I’d handle a probable hand attack. Number Three: I try to cross his eyes and buckle his knees…and even follow that up if necessary. I try never to under-estimate any assailant or his ability to receive punishment…nor do I over-estimate my own power and ability. Instead, I kick, hit, and follow through – hard, fast and furious! I’m from that old school that still believes in breaking boards and bricks, even if they don’t hit back. Therefore, I believe in conditioning my favorite weapons: hands, feet, elbows and shins. Plus, I teach my students Maki-wara and Tamise-wara (toughening and breaking). When they learn to break, they soon find out that some boards, bricks, and cement blocks are tougher than others. Some will take several strikes and / or harder strikes before they break or crumble. The first time a student appears to become somewhat aware of that phenomena, I take that opportunity to explain that men are like boards and bricks…some are much tougher than others. Therefore, if you can…Hit’em Back First, and Hit’em Hard, Fast, and Furious! Don’t worry too much about over-kill. If you ever kill a man empty-handed, or with a foot, you can bet it will be by accident, not by intention. People are hard to kill intentionally, especially mean bullies, thugs, and assailant types. Review: Keep It Simple, Simon (KISS) – Don’t get Fancy, Flashy, or Flamboyant. Use simple techniques. Stick to good old-fashioned basic kicks and strikes. Keep the tactics simple as well – don’t get complicated or too inventive. Put plenty of speed and power into each technique, but don’t run them together so fast that you sacrifice power and accuracy. Continue until you’re satisfied your adversary has had all the fun he can stand…and possibly enough to last him until he contracts “Old-Timers” disease and forgets who you are…or at least that he prays each night that you have forgotten him. The three most valuable secrets of self-defense are: S.S.S. – Surprise, Simplicity, and Similarity. Let’s address those elements in that order. Surprise…One may ask how can you utilize surprise when defending yourself? Most often you’ve been assaulted or attacked by surprise yourself. Well, first of all, most assaults or attacks should not be a surprise. Because normally, verbal, or at least hostile body language precipitates most assaults or even attacks. However, most of us are not of such an aggressive personality that we like to instigate or even initiate the first action. That, often, is a very wrong decision. By the time I was eighteen I must have been sucker-punched, kicked, slugged, or hit with a weapon first, some twenty times or more before I learned to recognize that a fight was actually going to start. I never liked to hit anyone first. However, I seemed to be in the vast minority of my associates. Finally, I learned to recognize when a hostile situation was escalating toward a fight. Consequently, I also learned that if a fight was obviously going to start…To Start The Fight! I learned too, that it was infinitely easier to win a fight as the puncher rather than as the punchee. With one exception, against a National Golden Gloves Champion, I had always, somehow, come back from “The Hole” and won. However, it was often difficult to tell much difference between me and my opponent, because I usually had the hell beaten out of me between their sucker-punch and the time I got my stuff back together and got going. “Starting” the fight myself was sooo much more fun. I said “starting” the fight – not “instigating” the fight. When it was apparent that I had to fight, eventually I learned to start the fight. I also found that I didn’t have to do as much damage to an opponent if I made the first move. One, I learned to Cross Eyes and Buckle Knees fast…which usually required much less follow-up – most guys didn’t want to continue a losing battle. Second, follow-up, if necessary, was normally fairly easy on a surprised and stunned adversary. Third, not being hurt and nearly exhausted prior to my counter-attack was physically much easier and emotionally less traumatic. And finally, by not being hurt and humiliated, I didn’t have the emotional need to retaliate so thoroughly. Therefore, less bloodshed for both of us! Eventually, I learned how to utilize the Element Of Surprise – and here’s how you can too. First of all, Don’t Get Surprised! To avoid being surprised, learn to read hostile surroundings and situations and to especially read hostile body language. Be more alert when in any probable or even possible hostile environment. Observe any arguments, fights, assaults, or attacks, then analyze and critique how they began, especially the body language of the aggressor prior to the incident. Try to recall any hostile or violent situation you were ever involved in and analyze it. That way, you can learn to become more aware and tuned-in to probable and even possible hostile situations. Most assaults can be anticipated by simple awareness. In the last thirty years (and numerous incidents), I’ve only allowed myself to get “suckered” once – and that was done by some very good acting, so that I failed to see any apparent hostility (although there had been plenty warning signs previously). Out of compassion I let pity over-ride my self-taught instincts and allowed myself to be sucked in. After getting a bottle broken across my face, once again, I had to fight from “The Hole”, and take out three young, strong, and very hostile guys. Once you’ve sensed hostility, Stay Alert. Don’t let something else distract your original instinct. Your instincts are like your first thoughts or answers when taking an exam, the first ones are usually right. Or, like a Marine Re-con Sergeant I once knew who had a lot of combat experience used to teach his recruits, “Your first twitch is usually right”. Therefore, don’t let any distraction confuse you or change your mind. Keep aware and alert until you’ve exited the danger zone – and become re-alerted when approached by the same person(s) or situation at any later time. Physically, never allow an apparently hostile person to enter into the danger zone (if possible). The danger zone is what I call the “Dumb Distance”. That’s the distance that a possible assailant could reach out and nail you with a hand, foot, club, knife or weapon (whether apparent or possibly concealed) without them having to initiate at least one step toward you before being in contact range. This is not always easy to do, especially if you are of a passive personality. A good method is to initially evade, if you can, by retreating back a step or two, or to one side. Then, if an apparent hostile adversary re-enters into contact range with you, he obviously isn’t there for your autograph…so Hit ’em Back First! Or, retreat…If you can? Never, never argue or stand “square” to anyone, much less against an apparent or possible hostile person(s). Standing square is very definitely a “Stupid Stance”. Square, you have all of your frontal and lateral vital targets exposed and available to any assailant. Plus, you have no “lead” hand for protection, distraction, or to attack with. Nor do you have any rear hand or rear foot for power in a counter-attack (rarely attack with a rear hand or rear foot technique). Remember, your front hand or foot is used for Speed and Distraction and your rear hand or foot is for Power and Destruction. Being right handed, I much prefer a right lead myself, especially against a “left lead” adversary (most right handers will lead left foot first and most left handers will lead right foot forward). Also, I’m in the opposite stance and angle that he is likely accustomed to. I am also farther from his right power and / or weapon hand. My front right hand is normally faster and stronger than his front left hand. Therefore, his nose and philtrum is wide open to my right back-fist…or a knife-hand to his trachea if I detect or suspect a weapon. Don’t let full contact fighters or kickboxers tell you a back-fist is ineffective. It’s not very effective with a boxing glove on, but bare-handed a good back-fist is devastating. I’ve stopped more fights with a back-fist and / or a front kick before they got started than most people have seen. His left front knee is close and very exposed to my right side kick…While my left, rear (power) leg front kick is lined -up and sighted-in at the best (90 degree) angle to his bells. If I can’t take out a baby gorilla when I Hit ‘em Back First with all those factors stacked in my favor, I deserve a tail-kicking. Normally, don’t assume a “fighting” stance before your adversary does, or possibly even after he does, and Absolutely Not if he shows a weapon. Forget your karate or kung-fu stances, most are useless, if not ridiculous. Not only are most martial art stances useless but they instantly alert your assailant to your intended retaliation (virtually death against a weapon – regardless of how good you think you are) and will certainly alert him to the fact that you’re probably going to kick. Such a stance may also entice or excite him into pulling a weapon beforehand. A martial art stance will totally destroy your element of surprise and also considerably limit your fighting ability. Martial art stances are only designed for show, not for go! Stand in a casual three-point, right lead, boxers stance. Hands down at the safe distance against a bare-handed adversary and hands up and open in a “talking hands” mode, or hands (fist) possibly in a boxer’s mode if he is already in a boxer’s stance and mode himself. The best way I know to kick a dude in the bells is to make him think you’re going to punch him in the mouth. And remember, your hands are definitely open and very apparently protective (defensive) if a weapon is apparent or suspected.